Tailgate Breakfast on the Grill! 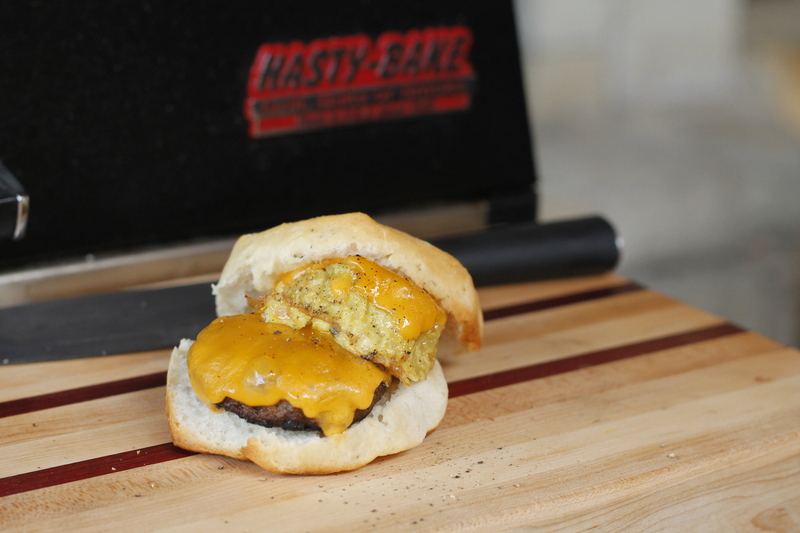 The Pit Buddies were in the Hasty-Bake test kitchen last weekend, working on a tailgate inspired breakfast recipe: sausage, egg, and cheese biscuits. While simple, it was still delicious! We baked biscuits, fried sausage, and scrambled egg all on the grill. Read on to learn the specifics on how we did it! This was pretty simple. We picked up a couple of foil cookie sheets, non-stick spray, and biscuits. 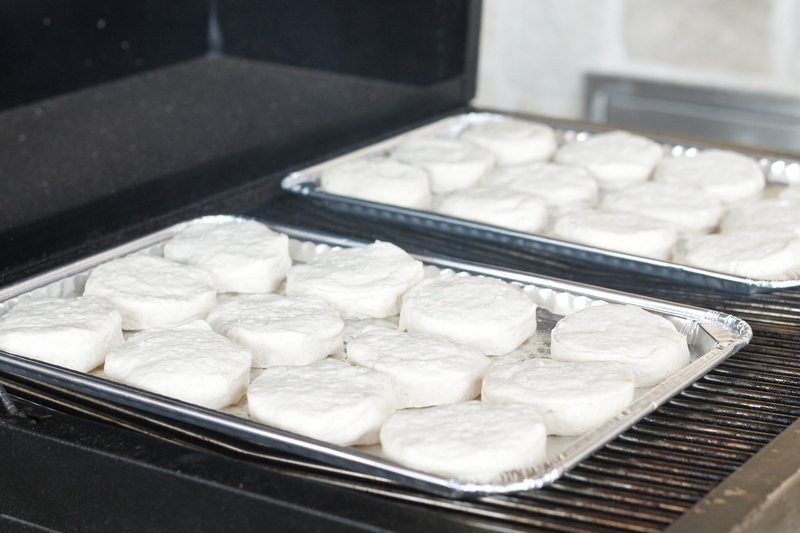 The biscuits were cooked over indirect heat to make sure the bottoms didn’t burn. Following the instructions on the biscuit can, the grill ran around 350° for about 15 minutes. They came out just right! Again, this was so easy! 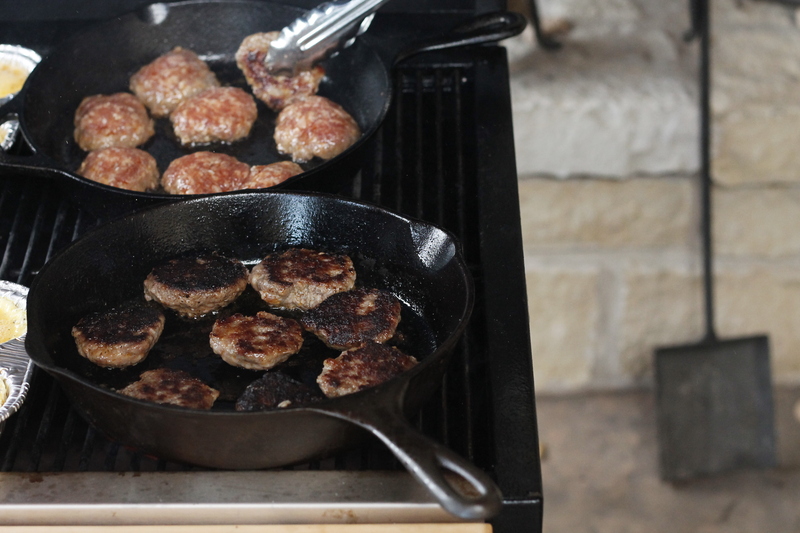 Using a couple of cast iron skillets, the sausage was cut and fried over direct heat. A few minutes on each side and they were ready to plate. This was the only aspect of the cook that presented a challenge. Because we were trying to come from a tailgate perspective, the question became: how do we cook scrambled eggs in a form without using a bunch of dishes? The answer: foil muffin pans! You can pick these up at any grocery store and they worked great. The eggs were scrambled with some salt, pepper, and a little bit of water to help retain moisture. You could easily spruce these up with other seasoning, vegetables, or other ingredients, but we went with the basics this time. The foil muffin pans were sprayed with non-stick spray and then ¼ cup of eggs were poured into each cup. 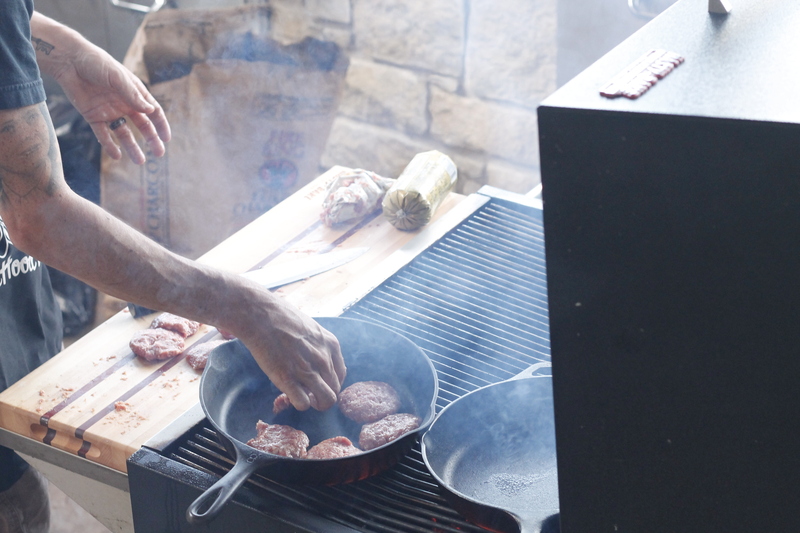 They were cooked over medium-high, direct heat, with the grill lid closed to help cook the top of the eggs. After about 3 minutes, they were mixed up with a fork to help cook evenly. Another 3 minutes later, they were ready. Because of the non-stick spray, the eggs came out easily. From there, all that was left was to assemble our sausage, egg, and cheese biscuits. We hope you find this basic recipe useful and will put your own spin on it this football season! 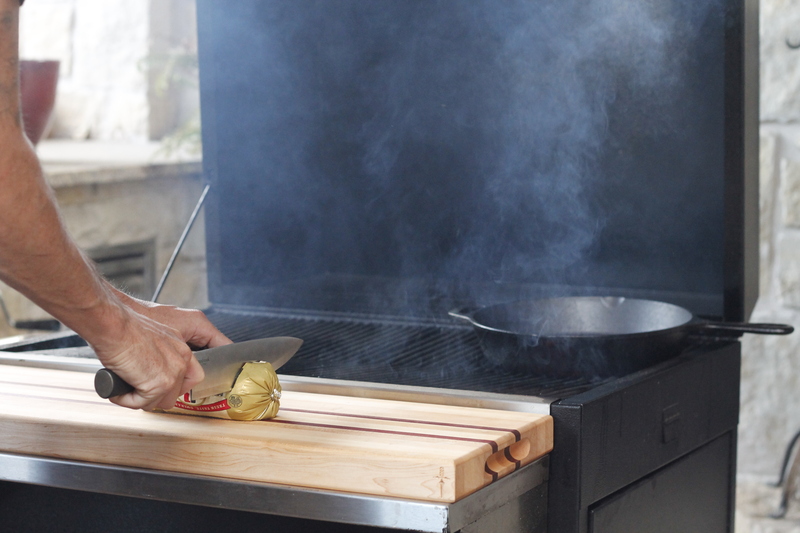 Let us know what delicious breakfast treats you have cooked at your tailgates, in the comments! I love the practical approach to something so good! You guys nailed it. Next time I’m thinking spicy sausage and grape jelly with a big’ol buttery biscuit. 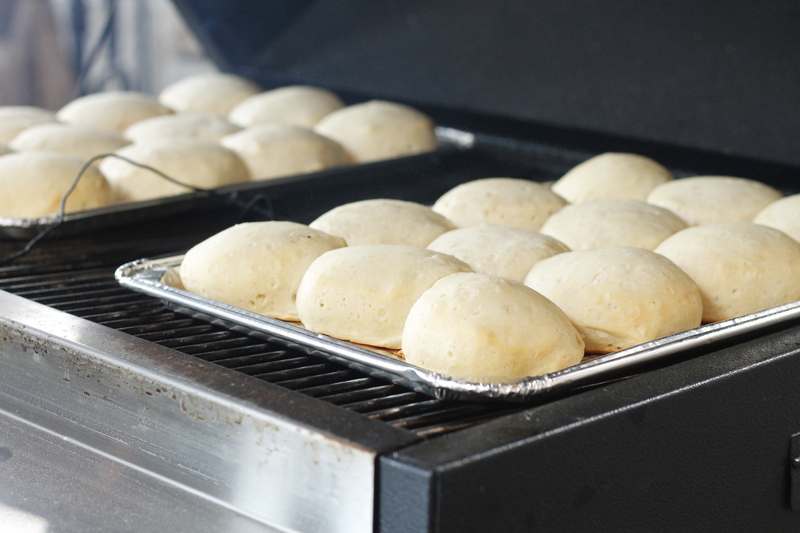 See you at the Hasty-Bake tailgate. Nothing like breakfast on the Hasty-Bake. Absolutely, Brian! There are endless tweeks to be made to this recipe. Maybe some jalapeno pepper jelly with chorizo?